What does the word sponsorship mean to you? When I think of the word I think of real car racing and a company handing a racecar team or driver a check in return for property on their car, hauler and crew to put their name on. Of course both parties have to agree on the terms of what is expected from each party. 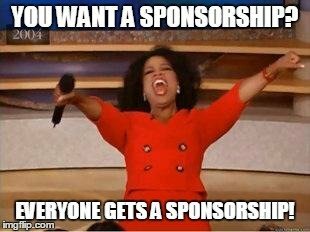 Now what does sponsorship in RC mean to you? It should mean kind of the same thing, right? RC related companies writing top drivers a check in return for their name on the cars and driver’s apparel, right? Not so much. It seems in RC there are different level of sponsorships meaning the amount of a discount they are giving a driver. Wait, but I thought we said above sponsorship meant money exchanging hands? Personally I feel that the only true ‘sponsored’ drivers are the “Ryans” and “Tebos” of the world. The racers racing for a living, actually getting paid to race as their sole form of income. The rest of the drivers that a getting deals are really just ‘contracted drivers’. This is the company’s way to make sure they get that customer to buy their products and in return HOPE by doing so they promote their products on and off the track. There seems to be a buzz in the hobby where drivers make a goal of getting sponsored. It’s almost like a racer feels he is not ‘sponsored’ he’s not a good enough. I remember not long ago to get a deal from an RC company you actually had to win races and be good. Not so much it seems anymore. Full disclosure, I am a mediocre racer at best and I got deals from a couple different companies myself when I sent resumes out. It’s almost like some companies are handing out deals like its Black Friday everyday just to get the sale. I am not saying it’s good or bad, it just creates this perception in the industry that everyone is entitled to a deal or discount. I get asked at least a couple times a week ‘do you sponsor racers?’. My response is the same every time. My products are high in demand and I am one guy giving up my nights and weekends to sit in my garage to make you the best products possible. I have no reason to discount my products just to make a sale. Lastly, 2 things. First, can we please get rid of the look of RC shirts. You know the ones. The ones that have all the logos in a row top to bottom. Those are so lame! Be creative folks! Next, when asking someone if they sponsor drivers be sure to spell correctly and take a different approach rather than just asking ‘hey do you sponsor racers?”. Give someone some reasons why you feel you are worthy.